Free Giveaway: Are You My Boyfriend? C.B. 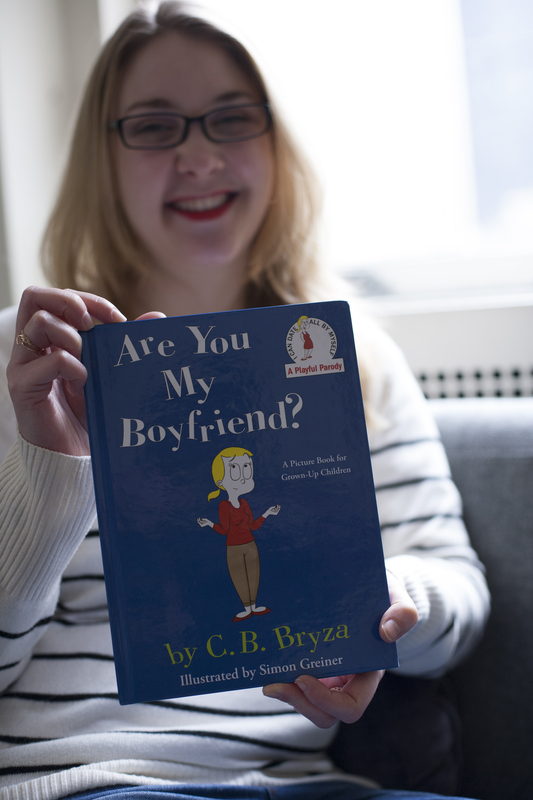 Bryza is not only the author of the endearing and hilarious new book, Are You My Boyfriend? , she’s also a member of my writing group! This book is a modern parody of the classic children’s book Are You My Mother? It’s a must-read for anyone who has sought out a genuine connection in the world. It has been a tremendous boost to the spirit of our writer’s group’s to have a published author in our midst, and I hope her journey can inspire you too! How long did you have the idea for Are You My Boyfriend? I thought of the idea for #AYMBF in 2006, and I wrote the book in 2012, so, I had the idea for about six years. What made you finally put it down on paper? I mentioned the idea to some friends at a children’s book–themed baby shower in the spring of 2012 and got really positive feedback, so that’s when I decided to write it, but I didn’t actually put it down on paper until June, after a particularly inspiring writing group meeting. Go writer’s group! The main character is an adorable blonde with tons of pep, quite like yourself. How biographical is the main character? Aw, thanks! I wasn’t thinking of myself as the main character when I wrote the book, but I definitely relate to her a lot, and we have definitely dated a lot of the same guys. And the more I get to know the character, the more I see myself in her. She’s actually something of a role model! What have you learned from the publishing process? The biggest lesson I’ve learned is that even though writing is a solitary process, publishing is a team effort. And one of the most important players a writer wants on her team is an agent, aka a reliable advocate and guide. Did you have any pleasant surprises during the process? I didn’t expect that I would get to contribute ideas for the artwork, but I actually got to be very involved, which was exciting. Simon (the illustrator) also added some great details that took my vision to another level. He really nailed it! And the artwork is absolutely adorable! What advice would you give an aspiring author? Write every day. Share your work. Ask for feedback, and be willing to incorporate it. (Writing classes, in person or online, can be very helpful for all that.) Above all else, don’t give up on something you believe in. And, lastly, do you believe in soul mates? I do. I don’t necessarily think there is one “perfect match” per lifetime, but I absolutely believe that people come together for a purpose, and that compatibility at the soul level is a big part of that. If you would like to win a free copy of this book, answer the question below in the comment section. I’ll be picking the winner on February 6. Of course, you can also buy your own copy by clicking on this link !